Abell and Cleland is a prestigious residential development in the heart of Westminster. The developers required a fire stop solution suitable for expanding and contracting pipework within the high rise building. 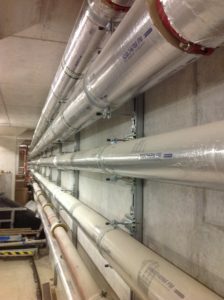 Large pipework in the basement required supports allowing for expansion, as well as fire stopping of the pipe penetrations through firewalls to ensure safety of fire escape routes. There were a number of different substrates and arrangements that required solutions, along with the added issue of pipe expansion and contraction. If pipe expansion and contraction is not correctly considered when installing a fire stop, the movement of the pipe could render the fire stop ineffective over time. Walraven’s range of fixing points and slide guides were ideal for fixing the large pipework system, whilst allowing it to expand and contract. The Pacifyre® MKII Fire Sleeve was recommended for fire stopping. 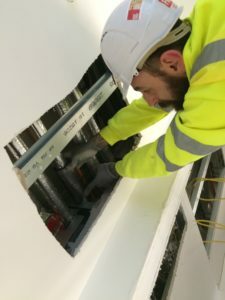 It is unique in that it allows pipes to expand and contract without compromising the effectiveness of the fire stopping – unlike fire collars which hold pipework static, preventing the pipe from expanding freely, potentially resulting in failure. Walraven provided technical advice, design solutions and on site support for this project. Would you like specialist advice about effective passive fire protection for expanding pipework? Call your Walraven Regional Sales Manager (RSM) to find out how we can help with a fire stop solution.